This Santa was made to look like an antique Santa from Germany. Santa has a clay hand painted face and his beard is the batting from an antique quilt. His coat is made from aged red cotton material. His under coat is aged red and white stripe. 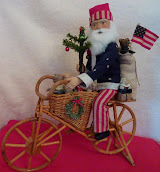 Santa is holding a hand made feather tree in one hand and a hand made antique style ornament in the other hand. The ornament looks like it was made in the 1800’s! 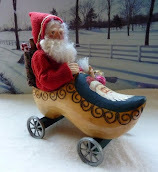 Santa is standing on a wooden base that has been sprinkled with German glass glitter. Santa measures 12” high measuring from the bottom of the base to the top of his hood. This Santa came out just stunning! He is made on top of an antique beehive bobbin. He has a hand sculpted and hand painted face and his beard is made from the batting of an antique quilt. His coat is made from an antique coverlet. It is just beautiful! Santa holds a bag with faux greens, red pip berries and white floral sprigs. In Santa’s other hand he holds handmade miniature sleigh bells. Santa has been aged to look old which gives him a loved, warm look. Santa measures 14” tall from the bottom of his coat to the top of his hood. The auction for this Santa will end on 10/30/2016.